A new aluminum alloy raises the heat threshold for cylinder blocks and heads to about 572 degrees. Engineers from Fiat Chrysler, Mexican engine parts supplier Nemak and the U.S. government's Oak Ridge National Laboratory have jointly developed a blend of aluminum alloy for cylinder blocks and heads that raises the heat threshold they can withstand from 390 degrees currently to about 572 degrees. 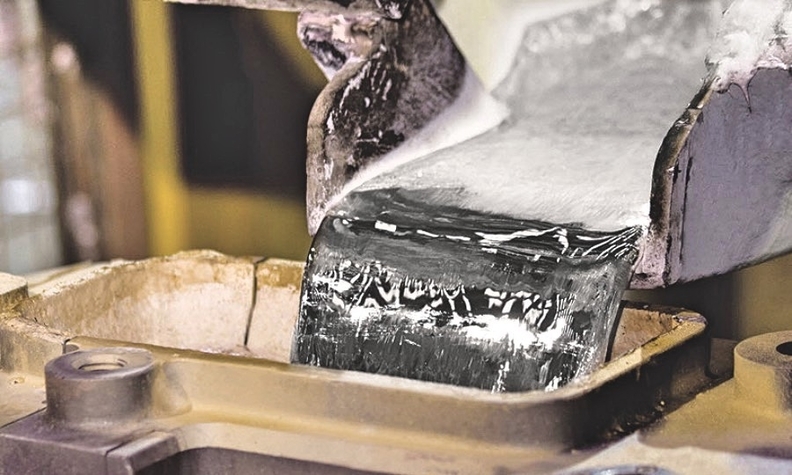 Hotter running engines are expected to deliver big gains in fuel economy and emissions, and FCA is evaluating the alloy to use in upcoming cylinder heads. "Cylinder head alloys are the most demanding application in an engine, if you consider the fact that the casting is smaller than the block — but more complex because other parts are attached to it," says Amit Shyam, Oak Ridge's lead researcher on the project. "It's more demanding from a thermal-mechanical aspect as well. The head sees many thermal cycles. If that was solved, it would be a very major advancement for better engine materials. That's why we focused on cylinder head alloys for initially lighter-duty automotive engines." Hotter-running internal combustion engines are a critical area of interest for the industry in the next decade. Despite efforts to roll back federal fuel economy standards, the targets set by the Obama administration stand, and automakers are still sprinting to meet them. Improved thermal efficiency will likely be an area of competitive focus. The less heat an engine wastes, the more efficiently it runs. Toyota has recently made big gains in improving thermal efficiency, bumping the Corolla's engine to 40 percent. First run should clearly be for the 572 Hemi. This goes directly against FCA's move with Dodge products, mainly that you only innovate as much as you absolutely have to, and never try to save weight, ever. I wonder how many prototypes they will burn to the ground experimenting with engine bay materials? It's a legit complaint, but saving weight on a long wheelbase vehicle is hard. Challenger wheelbase is 116" and Charger is 120". For comparison purposes, BMW 5er wheelbase is 117" and 7er is 126". MB S class short wheelbase is 119.5", long wheelbase is 124.6". Chevy SS is 114.5", Tauris is 112.9". Camaro is 110" and Mustang is 107". I'm just trying to provide perspective here; the only way to save weight is to go with a much shorter wheelbase, which means less space for occupants. I think Dodge would lose the few customers they have if they shrank Charger or Challenger; that's why they're not going to do it. They'd need to come up with different models altogether alongside Charger/Challenger. ^^ Giulia Hell Lion 572 Alumihemi, 6MT. Or they could try shoehorning the naturally aspirated all-aluminum 426 gen 3 crate engine into that Giulia and see how that goes first . Gimme a manual with that, supersize the R-comp's, would buy. Why would a prototype burst into flames? It's not engineered to do that until production. See, skipping steps always leads to problems. Did you see "The Lion King"? because that part where Banzi says "Mufasa" and give Shenzi chills, so she asks him to say it again, and he does; that's what's going on here for me when you say "Giulia Hell Lion 572 Alumihemi 6MT".